Europe does not know what Bulgaria did to save Bulgarian Jews from Holocaust death camps, Bulgarian President Rossen Plevneliev said in Paris on January 28 2013. In the French capital, Plevneliev held meetings with France’s president Francois Hollande, Plevneliev’s compatriot Unesco head Irina Bokova and visited the Holocaust Memorial. In 2013, Bulgaria, along with Israel, marks the 70th anniversary of the actions of Bulgarian Orthodox Church leaders, civil society and political figures to prevent the deportation of Bulgarian Jews to death camps. Speaking to journalists in Paris, Plevneliev said that the rescue of Bulgarian Jews during World War 2 was a “unique feat by the Bulgarian people and a true expression of Bulgarian civil society. My greatest ambition is to show it in a dignified way to the world,” Plevneliev said. He said that international recognition of this unique achievement would depend on how Bulgaria could show history as it was 70 years ago, “without equivocation and half-truths, and history as it was”. Plevneliev expressed regret that for 70 years, Bulgaria had not shown clearly the evidence for the rescue of the Bulgarian Jews and the documents related to this. He said that the truth was clear and showed that Bulgaria had been in no position to save the lives of Jews in Vardar Macedonia and Thrace. “From another perspective, however, Bulgaria managed to achieve something extraordinary that no one else had done, to save more than 48 600 lives”. Plevneliev said that at the same time, Bulgarian consulates in Europe, including in Paris, had issued more than 15 000 transit visas to Jews, which had saved many lives. Macedonia, a neighbouring country of Bulgaria, has seen critical perspectives on Bulgaria’s role in World War 2, notably including the film The Third Half which annoyed Sofia by its depiction of Bulgarians as enthusiastic collaborators with Hitler’s regime in the deportation of Jews from Vardar Macedonia and Thrace to, for instance, the Holocaust death camp at Treblinka. Bulgaria has responded with sharp criticisms of inaccuracies in the film. Meeting Bokova, Plevneliev discussed Bulgaria’s rescue of Jews during World War 2, as well as sites in Bulgaria which have been or could be included on Unesco’s world heritage list. 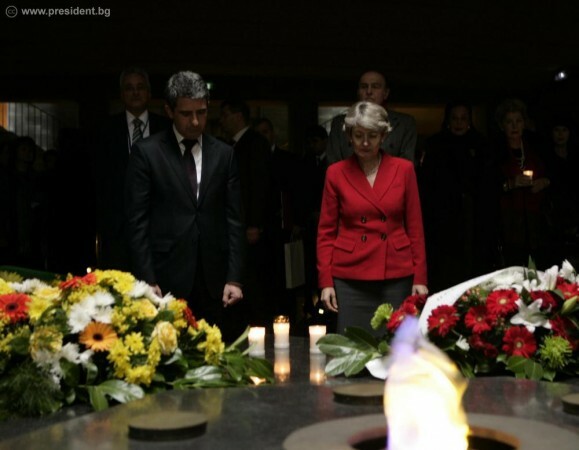 Plevneliev and Bokova together paid their respects at the Holocaust Memorial. After Plevneliev held talks with Hollande, public broadcaster Bulgarian National Television said that the French president had expressed support for a second term for Bokova as director-general of Unesco. Also discussed was future French investment in Bulgaria and the July 2012 suicide bombing terrorist attack on Israeli tourists in Bulgaria, with Plevneliev – in line with Bulgaria’s insistence on this point – saying that his country would not apportion blame for the act of terrorism until it was sure of the evidence.